Ericsson, Vodafone UK and academics from the King's College London team up for test. Vodafone has revealed the completion of the first ever successful demonstration of pre-standard 5G. The new network, working independently of existing 4G network tech, was created and tested by Vodafone UK and Ericsson, together with academics from the King’s College London. Vodafone said it will continue testing 5G technologies to look for new opportunities to help it provide better services before the technology actually deploys in 2020. 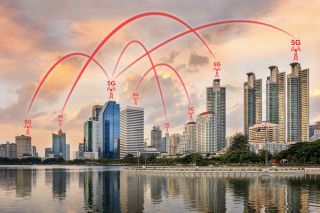 “We’re delighted to be the first provider to test standalone 5G in the field, however, building a 5G network will take time,” commented Vodafone UK head of networks Kye Prigg. “Right now, we’re also modernising our network by making smarter use of our existing mobile technology to keep ahead of consumption demands and provide the mobile coverage our customers deserve. Massive MIMO, a key building block for 5G, was also showcased at King’s College London. It uses multiple antennae to transfer data more efficiently. The project also includes adding different bands of mobile spectrum, allowing for faster speeds. Combining different bands of spectrum can result in speeds of more than 500 megabits per second. This will prove extra useful for video apps, IoT devices and connected vehicles.